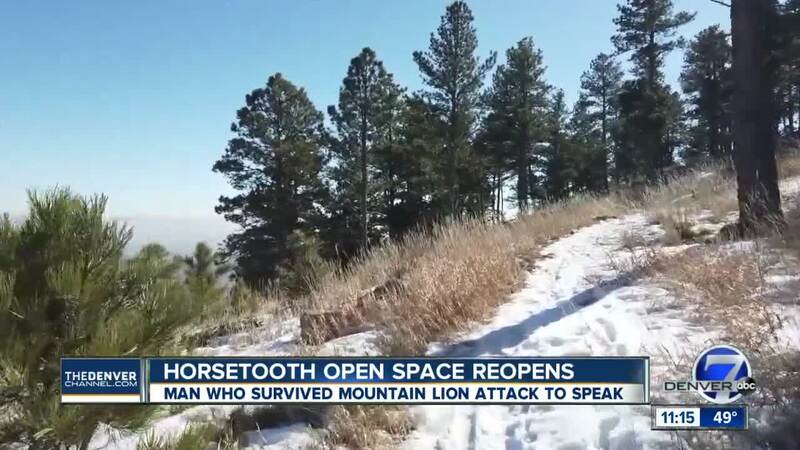 LARIMER COUNTY, Colo. — About a week and a half after a runner was attacked by a mountain lion , Horsetooth Mountain Open Space reopened and two mountain lions found in the park were captured, Colorado Parks and Wildlife announced Wednesday. The Horsetooth Mountain and Soderberg trailheads had been closed since Feb. 5 due to public safety concerns, CPW said. It reopened to the public on Wednesday morning. A male in his 30s was running on the trails on Feb. 4 when he was attacked by a juvenile mountain lion. He was able to fight back and, in self-defense, suffocated the cat , according to CPW. He was treated at a hospital for scratches and punctures, and was released the following day. The man, who has not been identified, is planning to talk about the experience at a press conference Thursday. Since that incident, rangers in Larimer County have been helping state wildlife officers assess mountain lion activity in the area , which is popular for outdoor enthusiasts. On Feb. 6, officers placed trail cameras in the vicinity of the attack to learn more about the mountain lions’ activities. Over the weekend, CPW captured two juvenile mountain lions at Horsetooth Mountain. CPW said it believes they are siblings of the lion that attacked the runner. Wildlife officers said they plan to move the animals to a wildlife rehabilitation facility before releasing them back into the wild. CPW said it will share more information on this on Thursday. Steve Gibson, district manager for Larimer County Department of Natural Resources, said this doesn’t mean mountain lions aren’t in the area. The mountain lion attack occurred on West Ridge Trail, which is one of the more remote areas of the open space. Horsetooth Mountain Open Space was created back in the 1980s due, in part, to its valuable wildlife habitat and to provide a place for wildlife to live on the Front Range. Larimer County said its staff is planning educational opportunities for visitors about recreating in mountain lion habitat.